If you have questions about your Alumni Association status or about the Alumni Association, please click the Contact Association link. Please note that this is the official Web site of the AHS Alumni Association. We are not related to nor associated with: https://www.alumniclass.com/abington - nor any other free alumni Web sites. THIS is your official Abington Alumni Association Web site! 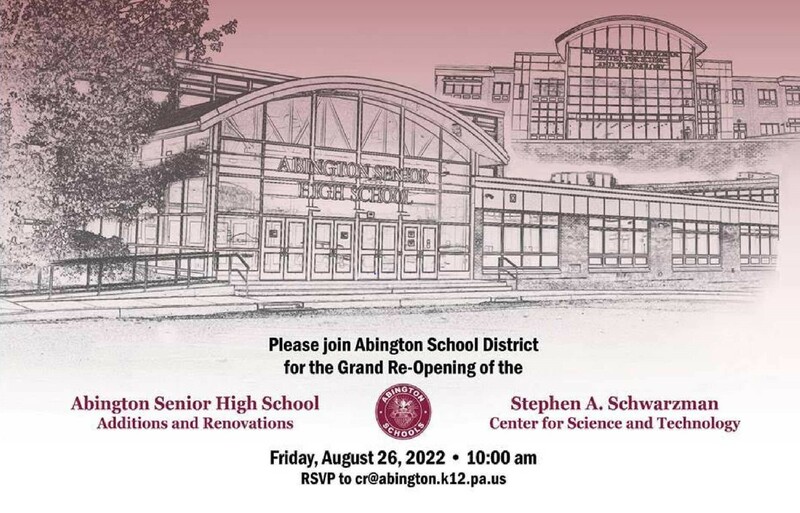 Abington Senior High School to be renamed after donor Stephen A. Schwarzman. Read the article here. "Alumnus Stephen A. Schwarzman, Chairman, CEO and Co-founder of Blackstone, will donate a landmark gift of $25 million to Abington High School to support the addition of a new science and technology center and allow for a full-scale renovation of the 1950s-era high school building." Memberships - Support your Alumni Association by becoming a member or upgrading your membership. You can use a PayPal account or a credit card. You can also mail a check to: AHSAA, P.O. Box 55, Abington, PA 19001. Make payable to Abington High School Alumni Association. Use the menu below to select the level of your contribution and then click the "Add to Cart" button. Click the menu to select your membership type. donations - You can make a donation of your choosing by clicking the button below. You can use a PayPal account or a credit card. You can also mail a check to: AHSAA, P.O. Box 55, Abington, PA 19001. Make payable to Abington High School Alumni Association. Notable alumni - A few of the notable Abington alumni from over the years. Century Club - The Century Club membership is comprised of alumni and teachers who have contributed $100 or more to the association. In the table "T" indicates Teacher. 500 Club - The 500 Club is comprised of alumni and teachers who have contributed $500 or more to the association. In the table "T" indicates Teacher. K Club - The K Club is comprised of alumni and teachers who have contributed $1000 or more to the association. 50+ Club Info - The 50+ Club holds an annual luncheon for those graduating classes which have surpassed their 50th reunions. Reunions information - If your class is planning a reunion please send us your information using this reunion information form. You can also request the latest update of your class database as well as mailing labels. Class Links - If you have a class online presence please let us know by clicking the "Contact Association" link below. We'll add a link on the Class Links page. In Memoriam - Notes on alumni who have recently passed. volunteer - If you would like to volunteer there are several areas where you can help. If you're willing to help, please click the Association Contact link. Ghost Stories Newsletters - We have some gaps in the issues we've been able to find. If you have any of the missing newsletters we'd really appreciate it if you could scan them and email them to us. Or, if you don't have that capability, please mail them to the Alumni Association office (see below). We will scan them and return them to you. Abington High School Hall of Fame - Note: This link is to an external site. Hall of Fame Past Recipients - Note: This link is to an external site. Abington Schools Website - Note: This link is to an external site. Abington Senior High School Store - The store at the senior high school has a variety of great Abington items. Check it out! - Note: This link is to an external site.